Andrea Nathan Davis is an award-winning designer and producer, and was the lead designer of the Dragon and Lich Boss Decks. Andrea is currently pursuing a Master’s Degree in Game Design and Development at the University of Limerick in Ireland. The Boss Decks are designed to be a major challenge for both the player being the boss, as well as the player(s) challenging the boss. We completely changed the Hero Realms game with these two decks – everyone is playing the same game but they are playing by completely different rules. 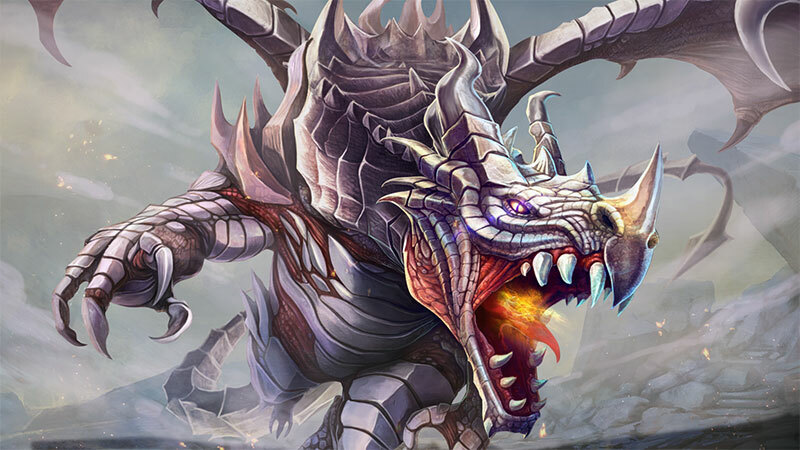 In this article, I will discuss some of the fundamentals of the Dragon’s decks, and how the heroes can fight back! What is the Dragon Boss Deck? If you haven’t played with the Boss Decks before, welcome to a brand new way to play Hero Realms. The Boss Decks pit a group of players against a Boss player. The Boss controls a super-powerful enemy, with special decks of cards! They are designed to face against 1 to 5 players, each using their favorite Character Pack. While the Campaign features an ongoing challenge where players face against enemies in a way the cards control, the Boss Decks offer one-off challenges that another person controls. It’s a great way to play between Campaign sessions, and for “veteran” players to take on a horde of new players at once! The Dragon’s starting deck changes based on the number of opponents it is facing, so the way the heroes should approach this challenge should change as well. The number of cards in the starting deck and the dragon’s hand size change, of course, but the specific cards that are added to the deck make for important changes that should not be missed. What this chart shows us is that as the number of heroes increases, the Dragon’s buying power increases and damage-per-hero decreases. While the total damage increases (as one would expect), this scaling has some hidden weaknesses for heroes to exploit. When the Dragon is facing only one hero, I consider it more of a fight against a “baby dragon.” Which, to be fair, is still a mighty challenge! The Dragon only has 7 gold in their deck (five cards that provide one gold, and a Ruby which provides two gold), meaning that each hero starts with more gold than the dragon! On the other hand, the Dragon has 11 damage plus the two-to-everything Dragon’s Tail. Even if the Dragon doesn’t add any damage to their deck (very unlikely), most heroes could be defeated in just 11 or 12 turns. Smart heroes will leverage their early game economic advantage to recruit champions with 5 or more defense, cards that provide healing, or both. One benefit of focusing on the economy early is that players are more likely to purchase expensive cards during their second time through the deck, so they can pass skill checks and steal the Treasure Hoard items. Those items are key to the Dragon’s success when it faces one or two heroes. Champions with 4 or less defense are almost never going to survive a turn. Many champions, especially those that cost 4 or less to acquire, really only become worth acquiring if they can survive a turn. Here is a simple comparison: Bribe vs. Street Thug or Droga, Guild Enforcer. The both champions will require multiple turns to generate the value of Bribe. (Droga has tremendous value in the late game, however, with his stun-on-demand ability.) This comparison can be made across all four factions — Influence vs. Death Cultist, Elven Gift vs. Wolf Shaman, and Recruit vs. Tithe Priest all have similar differences. For many players, their initial instincts would be to go as aggressive as possible as the Dragon starts with only 50 health. Don’t be fooled! Unless the market is filled with these cards at the beginning, it might be a big mistake to ignore the mid-game power of the Treasure Hoard! The addition of a second Dragon’s Claw and Ruby help the Dragon a great amount, but the addition of a second hero dramatically increases the options for the heroes. While the Dragon will deal 8 damage per turn at the beginning, it has to deal with two players. This means that more champions become viable options and are slightly more likely to survive. Making use of the Cleric’s Bless skill is one common tactic, but Clerics should not go down this path too early. If your deck isn’t good enough, sometimes you have to spend your gold improving it. Help yourself before you help others! One key detail to note: When the Dragon is facing fewer than three heroes, it does not have either Cunning Blow or Prismatic Diamond in its starting deck. This means that it doesn’t have a free “stun a champion” every other turn, and it doesn’t have a three-gold card in their starting deck. Stalling strategies are more effective than they might seem! It is important to note that until the Dragon acquires a card that gives 2+ gold, it is almost impossible for it to purchase a 7-cost or 8-cost card. (The Dragon needs to draw extra cards to even have a chance to get to 8.) One possible strategy to maximize this is for the Thief player to use her Heist ability to steal the best gold-giving card out of the Dragon’s discard pile as soon as she can. Players are faced with a challenge of dealing hundreds of damage. What it means to be “aggro” is completely different. Someone needs to be able to reliably taunt the Dragon, because at some point the Dragon’s deck will become so powerful that it can defeat a hero in a single turn! With three or more heroes, it is extremely difficult to defeat the Dragon without effective use of taunting and stealing treasures. Player seating order is critical. There are so many configurations for players to explore, and I don’t believe I have found the “best way.” There probably isn’t a best way to seat the players in general, but there is likely a best way for your playing group and play tendencies. The one nearly-universally-agreed rule is that the Cleric should not be the first or the last player, because this cuts her ability to heal down to only one player. But don’t give all of the healing cards to the Cleric, because it will make her an even bigger target for the Dragon! Pay careful attention to the Dragon’s cards. If the Dragon hasn’t played Prismatic Diamond yet during this shuffle of their deck, the value of the Cleric’s Bless skill goes down. That said, the value of Bless goes up if the Dragon has not yet played Dragon’s Tail. Bless is often just barely enough to help some champions survive when they would otherwise fall. The best Clerics are always tracking the Dragon’s every move. The Fighter’s main job against the Dragon is to get their deck to the point where they can taunt on demand. Of course, the Fighter’s Crushing Blow ability makes his first taunt almost certain. But beyond that, he will need to focus on damage. The Fighter needs to be such a threat that the Dragon cannot ignore him. Most players will put the Fighter in the first or second seat, but this doesn’t always work — he needs to have a clear path to get to the Dragon before he can deal enough damage to successfully taunt. I’ve seen successful Fighters play from every seat, and it really comes down to your group’s play style. 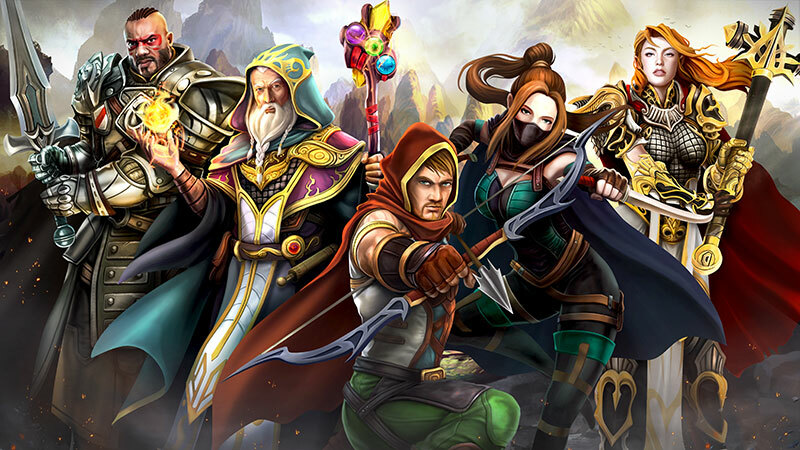 Many people feel that the Wizard is underpowered as compared to the other four heroes. I don’t agree with this, but I do think he has the least-obvious path to victory. The Wizard is the only hero that can change gold into cards. He has to survive long enough for this to be the best play, but once it does he is drawing 20% more cards than every other hero every turn! Wizard players should use this perceived weakness to quietly assemble a combination deck. Card-sacrificing cards from the Necros are good for anyone, but they are especially good for this player. When I face the Dragon, I usually choose to be the Wizard, and ask very nicely if I can sit next to the Cleric. Then, I try to piece together a magical engine that will suddenly deal 50+ points of damage in a single turn! The Ranger is the other potential combo-deck. While he cannot turn gold into cards for the turn he is playing, he can Track to set up future turns. While the Wizard has a great mid-game ability to Fireball the Dragon’s board, the Ranger’s Headshot should not be saved for very long. Headshot combines well with other players, which is a good argument for placing the Ranger in the first seat, believe it or not! Headshot clears the way for the Fighter to taunt the dragon. It also puts a high-value target into the discard pile, so the Thief can steal it right away. In addition to her incredibly-powerful Heist ability, the Thief can also Pick Pocket. This provides a surprising amount of durability over the course of a long game. Dragons are not likely to attack the Thief first, giving her time to hand out health potions to both herself and her neighbor. And why “neighbor,” singular? I prefer placing the Thief in the final position. She begins the game with nine gold in her deck, including two Ruby cards that give two-gold each! The other three cards in the deck all have the potential to let the Thief draw additional cards as well. This means the Thief has the best chance to deny cards to the Dragon! To play this denial strategy, the Thief needs to care less about building an efficient deck that hits ally abilities every turn. She needs to focus on buying the best available card in the Market, to deny it from the Dragon. As the last player, the Thief has the ability to set the table, leaving only leftovers for the Boss to pick through. Another benefit of this strategy is that it makes the Thief the best player to steal Treasure Hoard items. Thematic and powerful! The Dragon and the Lich Boss Decks require the base Hero Realms game, and one or more Character Packs. Each Boss Deck has a suggested cost of $10 and can be found at stores that carry Hero Realms. You can also find them on our web shop. Happy to hear you are excited about it. We don’t yet have a date, but we are working on the next campaign deck.